Glassy Pool | Music | Style Weekly - Richmond, VA local news, arts, and events. Composer Philip Glass at his piano. Philip Glass’ music often feels as natural as pooling water. Throughout his Oct. 5 Modlin Center for the Arts performance with the violin virtuoso Tim Fain, Glass’ repetitive, slowly circling solo piano arpeggios felt like rain clouds moving across an empty desert. Or ripples in a clear pond. Definitely watery. 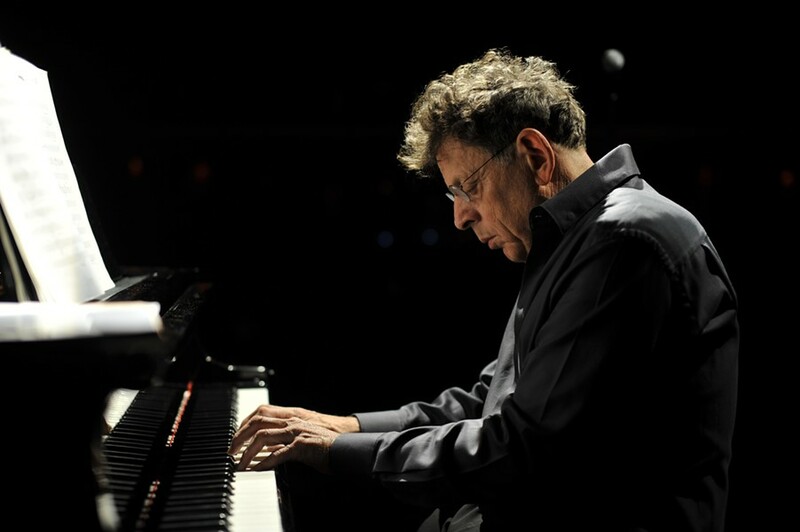 The roughly 80-minute program provided the climax of the University of Richmond’s Philip Glass festival, which celebrated the famous composer’s 75th birthday. With the exception of Fain’s dazzling technical skill on several pieces, the concert was not much different from a Glass performance I saw in California during the late ’90s. The composer would probably find that observation wrongheaded, and I’m sure there were slight variations in his playing, but for the most part the differences felt very subtle. Glass would likely respond, as he did last Sunday in The New York Times, that his brain had changed so much that whenever he plays his older compositions, they feel completely new. Yet old pieces like his “Metamorphosis” (1989), from which he played numbers four, three and two, sounded exactly like the studio version. (In the same Times interview, Glass gives a shout-out to locals Eighth Blackbird, who were a part of the festival. Clearly, the Richmond trip was still fresh in his mind). The concert sampled over three decades of his work, which still sounds as meditative as ever, rooted in the drone of Eastern music. The composer began in the 1960s by transcribing the work of Ravi Shankar, with a focus on melody and rhythm. Modern audiences probably recognize Glass’ music most from his haunting film soundtracks. The style is so ingrained now that I’m surprised Apple hasn’t added a Philip Glass effect alongside the Ken Burns option in iMovie. But really his most interesting music in recent years has been in collaboration with other artists -- and that’s what stood out tonight. Both times Fain joined Glass onstage, the audience seemed to perk up their ears. The most unusual and modern-sounding piece of the night was “Wichita Vortex Sutra,” which Glass played to a recorded reading of an anti-war poem by the late Beat poet Allen Ginsberg. The poet allegedly wrote it over a few hours while driving cross-country -- and it sounded like it. This didn’t work for me, as the competing, amplified volumes made parts sound muddled, like cocktail chatter. It was interesting nonetheless. Other pieces were paced well and included “Mad Rush” (solo piano); the Bach-modeled and tightly structured “Chaconne from Partita for Solo Violin”; music from “The Screens”; and the closer, the upbeat and bravura-styled “Pendulum” for piano and violin, a work originally commissioned for the American Civil Liberties Union’s 40th anniversary in 2010. Glass had responded to an audience question the day before by saying that it was relatively easy to find your own voice, but losing your voice was the hard part. Maybe it’s his Buddhist leanings, but Glass seems to be striving to completely lose himself in his music. One gets the sense they are witnessing this studied, lifelong attempt when he plays. He’s moving away from the minimalist tag and sticking with repetitive structures, like a mantra. It’s the reason why I believe Glass probably wouldn’t be bothered by a review written by someone who knows very little about classical music. He seems repulsed in general by the traditional stuffiness of the genre or any unwillingness to experiment with new sounds. Glass has an upcoming double album due to be released on Oct. 23: “Rework: Philip Glass Remixed” by pop artists including Beck, Amon Tobin, and Tyondai Braxton.